Excess leaves restrict sunlight, nutrients, and water from reaching your lawn. Potentially destroying your lawn for the following spring season from disease, insects or overall stress. 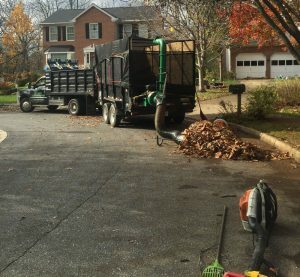 Unlike the kid next door, or some guy with a rake and a pickup truck, we have the capability to haul all of those leaves away, creating a clean and professional look. We have the top of the line equipment from leaf catchers for our commercial mowers, leaf vacuums, walk behind blower and backpack blowers to make your clean up as efficient as possible. Whether you want to have your leaves removed one time or throughout the fall season, feel free to contact us for an estimated time. For landscapes with a lot of leaves, we recommend at least two clean up to avoid turf damage. Prices start at $150.00 to collect, vacuum, and haul away. We also offer curb-side pickup starting at $75.00.